TORRANCE, CA - LEDtronics® announces its latest generation of PAR30-Style LED spotlight bulbs. 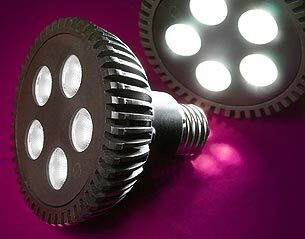 The PAR30 LED bulb is made up of five three-Watt high-power LEDs. PAR30 LED bulbs are direct incandescent PAR30 replacements, combining advanced Light Emitting Diode (LED) technologies, standard 25mm Edison screw-in bases, and light optimizing designs producing 480 to 544 lumens of vivid light depending on the bulb model. The list price for each PAR30-style LED bulb is $110.00. Large quantity discounts are available for qualified distributors. Availability is stock to 6 weeks. PAR30 LED bulbs carry a three-year limited warranty. For additional information on how to incorporate energy-saving PAR30 LED bulbs into your architectural lighting designs, contact LEDtronics toll free at 1-800-579-4875, telephone 310-534-1505, fax at 310-534-1424, click here to email us or postal mail at LEDtronics Inc., 23105 Kashiwa Court, Torrance, CA 90505. Visit our website at: www.LEDtronics.com.